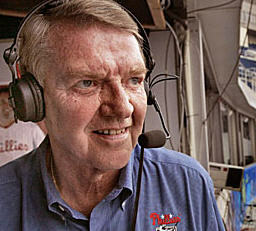 (ESPN.com Wire Services)WASHINGTON -- Radio and TV broadcaster and longtime ASA member Harry Kalas, whose baritone delivery and signature "Outta here!" home run calls provided the soundtrack to Philadelphia baseball for nearly four decades, died Monday after collapsing in the broadcast booth before the Phillies' game against the Washington Nationals. He was 73. "We lost our voice today," Phillies president David Montgomery said. "He has loved our game and made just a tremendous contribution to our sport and certainly to our organization." Familiar to millions of sports fans outside Philadelphia for his voice-over work with NFL Films, "Harry the K" was beloved at home. Since 1971, he was the man who was the bearer of news -- good and bad -- to those who followed the losingest franchise in major professional sports. When the Phillies won their second World Series title last fall, Kalas -- who normally called only the middle three innings on radio -- was in the booth for the last out of the clincher. He then joined the on-field celebration, grabbing a microphone to sing Frank Sinatra's "High Hopes." That song was among several Kalas standbys that endeared him to Phillies supporters. Another: He would call homers by a certain Hall of Fame third baseman by noting the player's full name -- "Michael Jack Schmidt." Many people asked Kalas to record outgoing messages on answering machines -- or more recently, cell phone voice mail -- using his "Outta here!" line. And he always complied with those requests, said Phillies radio broadcaster Scott Franzke. "Players come and go," Franzke said, "but 'Outta here!' -- that's forever." Kalas didn't get to call the final out of Philadelphia's other title, in 1980, because Major League Baseball prevented local broadcasts of the World Series games. But Phillies fans complained and the rule was later changed. A recipient of the Baseball Hall of Fame's Ford C. Frick Award for his contributions to the game, Kalas was one of the last longtime announcers closely associated with one city. Another, Vin Scully, threw out the first pitch at the Los Angeles Dodgers' home opener Monday, marking his own 60th year with that club. "He was not only a multitalented fellow with a wonderful voice. He was a lovely guy. I mean, everybody liked Harry. The city of Philadelphia will just be in mourning because they loved him so much," Scully said. "I'm happy for him that his team was world champions last year, so he had the thrill of that." The Nationals and Phillies discussed whether it would be appropriate to postpone the game, but Montgomery said Kalas "would have wanted to play the game." There was a moment of silence in Kalas' memory before the first pitch in Washington and at other baseball stadiums around the country Monday. The Phillies had been scheduled to meet President Barack Obama at the White House on Tuesday, a day off, to be honored as World Series champions, but the event was postponed. A new date has not been set, Obama spokesman Josh Earnest said. To a whole generation of football fans, Kalas also was a signature figure. Joining NFL Films as a narrator in 1975, he did the voiceover for "Inside the NFL" from 1977 through 2008. Kalas predecessor John Facenda "was the 'Voice of God' and Harry Kalas was the 'Voice of the People,'" NFL Films president Steve Sabol said in a written statement. "In many ways, Harry is the narrator of our memories. His voice lives on not only on film, but inside the heads of everyone who has watched and listened to NFL Films." Kalas also was the voice for Chunky Soup commercials and Animal Planet's annual tongue-in-cheek Super Bowl competitor, the Puppy Bowl. Cincinnati Reds broadcaster Marty Brennaman, a contemporary of Kalas' and a fellow Ford Frick Award winner, said Kalas' legacy will extend beyond the broadcast booth. Brennaman said he spoke to Kalas by phone late last week. The friends talked for 45 minutes, and among other things, they discussed the importance of eating right, getting enough sleep and dealing with the hectic lifestyle of a major league broadcaster at an advanced age. The Phillies taped up a color photo of their broadcaster inside the dugout Monday, with the words "Harry Kalas 1936-2009" written underneath. When Philadelphia's Shane Victorino homered in the third inning, he paused after touching home plate, crossed himself and pointed with his index finger toward the broadcast booth, where Kalas would have been working at Nationals Park. Instead, Tom McCarthy handled Kalas' duties at the start of the Comcast SportsNet telecast of the game. "The voice that carried all the memories since 1971, when the Vet opened, will no longer be behind the microphone," McCarthy said on the air. Shortly after noon Monday, Kalas was in the visiting clubhouse at Nationals Park, jotting down the Phillies' lineup so he'd be ready to help call the game. About half an hour later, he was discovered in the booth by the Phillies' director of broadcasting. Kalas was taken to a local hospital, where he was pronounced dead, the Phillies said. Kalas had surgery earlier this year for an undisclosed ailment that the team characterized as minor. He looked somewhat drawn last week as the Phillies opened the season at home. Kalas is survived by his wife and three sons, including one -- Todd -- who is a broadcaster for the Tampa Bay Rays. Funeral arrangements were pending. His family issued a statement saying it was "overwhelmed by the outpouring of love and affection from all of Harry's fans and friends cross America. Especially the Phillies fans whom he loved as much as the game of baseball itself." Back when he first arrived in Philadelphia, he wasn't immediately embraced by Phillies fans. But Kalas evolved into an iconic sports figure in Philadelphia, sharing the booth with Hall of Fame player Richie Ashburn until Ashburn's death in 1997. "I heard Harry's voice probably for the first time as a 9-year-old kid. I grew up listening to Harry," said 46-year-old Jamie Moyer, the winning pitcher for the Phillies on Monday. "He was just a great ambassador for the game." Said commissioner Bud Selig: "Baseball announcers have a special bond with their audience, and Harry represented the best of baseball not only to the fans of the Phillies, but to fans everywhere." Kalas fell in love with baseball at a young age, when his father took him to Comiskey Park to see the Chicago White Sox play the Washington Senators. It was a rainy night, and Kalas sat with his dad behind the Washington dugout. "Because of the rains, the field was covered," he once said. "There was no batting practice, so the players really didn't have anything to do. Mickey Vernon popped out of the dugout, saw this wide-eyed kid -- me -- picked me up, took me in the dugout, gave me a baseball, introduced me to his teammates, and thus began my love of baseball and the Washington Senators." He maintained that enthusiasm for the game throughout his career. The son of a Methodist minister, the Naperville, Ill., native graduated from the University of Iowa in 1959 with a degree in speech, radio and television. He was drafted into the Army soon after he graduated. In 1961, he became sports director at Hawaii radio station KGU and also broadcast games for the Hawaii Islanders of the Pacific Coast League and the University of Hawaii. Kalas was a member of the Houston Astros' broadcast team from 1965 to '70 before joining the Phillies. Phillies radio broadcaster Larry Andersen -- who worked with Kalas in the booth after being a Philadelphia pitcher whose play was documented by Kalas -- had tears streaming down his cheeks as he spoke about his partner before Monday's game. "He found the good in everybody, especially the players," Andersen said. "He loved the players. He loved being around them."